Bits or pieces? : On the future. I often talk about the importance of situational awareness. 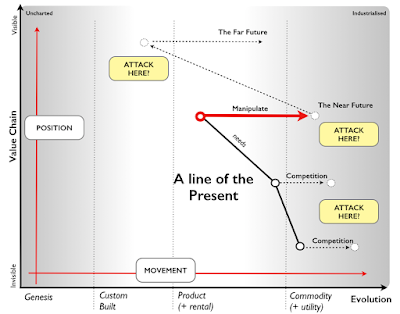 The technique I use for this, is known as Wardley mapping and you can read about it on CIO magazine. If you're new to this then the rest of the post won't make sense and so I'd advise you to save some time. Tl;DR it's complex. 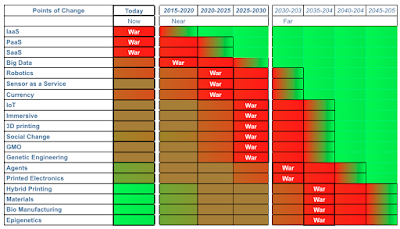 Once you have a map, it becomes fairly easy to see how a market will evolve. There are numerous common economic patterns from componentisation to co-evolution to inertia along with various forms of competitive gameplay that can be used to manipulate this change and create an advantage. 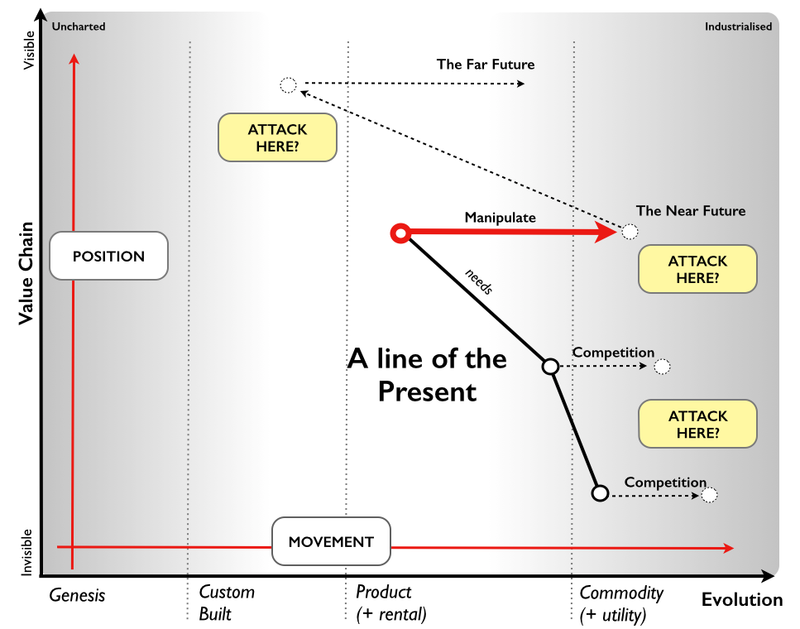 With a map (which provides position and movement) of an economic space you can examine the line of the present and work out points to attack. From here, working out strategic play (i.e. why attack here over there) is fairly easy. I've summarised this in figure 1. Figure 1 - Determining future from now. With reasonable situational awareness you can anticipate certain changes and prepare for them through scenario planning. You can avoid getting caught out unnecessarily. This is more than enough (along with operational efficiencies through removing duplication and bias) to compete against most companies. However, there are some more advanced techniques. When we look at a map, certain aspects of change are more predictable than others. I've provided a list in figure 2. 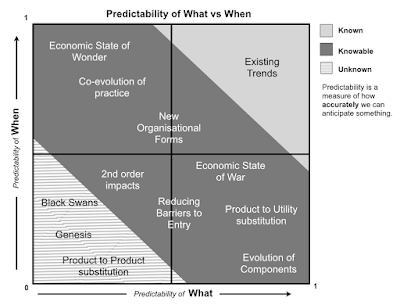 Figure 2 - Predictability of Change. For example, existing trends (i.e. stuff that is happening) are fairly obvious in terms of what (i.e. the trend) and when (i.e. now). There's little advantage in this stuff despite it filling up endless management journals. At the same time there's the unknowable e.g. genesis of a new act or impending product to product substitution. The best you can do here is scan the environment, notice it's happening (i.e. it's become an existing trend) and react accordingly. You can't anticipate this stuff i.e. Blackberry couldn't anticipate the iPhone would appear and disrupt it. However, the knowable stuff is the most interesting because here you can create an advantage and you can anticipate what is going to happen (but not when) or vice versa. In certain special cases you can do a reasonable job of both through the use of weak signals but I'll get onto that. For example, when something new appears we can anticipate that if there is competition (supply and demand) then it'll evolve! We can even specify the stages of evolution (for activities, practices, data and knowledge) e.g. an act will evolve from genesis to custom built to product (+rental) to commodity (+utility). We can state how its properties will change (from the uncharted to industrialised) and how competition will drive this. I even know that on average it'll take 20 - 30 years to go from genesis to the point of industrialisation. We know an awful lot about the what. Unfortunately we can't predict when the state changes will occur with any detailed level of precision as this depends upon individual actors actions i.e. I know bio-printing will eventually become a product and then a commodity component but I don't know who will make this happen or precisely when each of these state changes will occur. However, there are some special classes of change. For example, I know that any act will evolve from product to commodity (+utility). But, I also know that as it does so, past product companies (suffering from inertia built up during a time of relative peace between product vendors) will be disrupted by new entrants. It'll take about 10-15 years for the change to become obvious and the past vendors to be on their way out. There'll be an explosion of new activities built on top of this commodity (a time of wonder) and a change of practice related to the act (co-evolution). There's an awful lot I can say about the what of this product to commodity (+utility) state change, which we describe as a point of 'war' in the economy. Fortunately, in this special case there's a very specific weak signal technique which I can use to narrow down the target range of when a 'war' is going to occur. I've provided some results from this technique in figure 3. It's through an earlier version of the technique that I knew that compute was moving towards a utility before AWS. It's also how in Canonical in 2008, I knew we had to focus on the co-evolved practices (devops), as well as capturing the cloud market, any new activities building on top and how past vendors had far less time than they realised. So, for example, I happen to know the 'war' in 'big data' systems is kicking off. I've actually known for quite sometime this was heading our way. This 'war' means we will see utility providers in this area (they already have launched). The 'big data' product vendors (who have inertia) will dismiss these players and declare that the new entrants are useful for development but when it comes to production you will want to talk to them. They'll probably even spread FUD. However, in about 10-15 years the past vendors will be in serious trouble. I can even tell you that this type of change (known as a punctuated equilibrium) will catch those past vendors out i.e. in 5-10 years those vendors will be crowing about how the new entrants represent less 3-5% of the market but by 10-15 years those new entrants will be 30-50%. If you want (and I felt inclined), I could already give you a list of the dead. This change will cause an explosion of new activities (i.e. genesis) based upon these standard components in a time of wonder around data. I know that a time of wonder will occur, I can say roughly when but of course I don't know what those new activities are (no-one does). Genesis is unpredictable but at least I can tell you to keep an eye out - new stuff will happen! There will also be new practices developing around the use of such utility services, we'll probably even give it a meme (hopefully not DataDev or DataOps or any other awful combo). Now, if I understand my value chain then I can scenario plan around fairly predictable patterns and use weak signals to identify when it's likely to happen. I can't avoid the unpredictable (e.g. product to product substitution) any more than I can avoid the need to gamble and experiment in the uncharted space if I'm trying to create something new. But I can ruthlessly exploit the knowable against opponents who can't even see the board. If they could, they'd never be disrupted by anticipatable forms of change (e.g. cloud) because even with the inertia, you could overcome it. 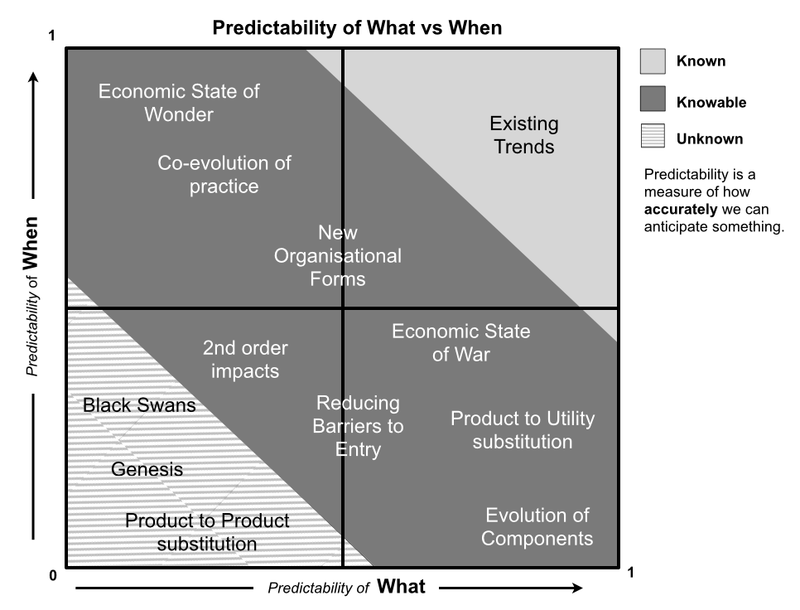 For most companies however, they have little to no situational awareness which means everything bar the obvious existing trends appear to be unknowable and comes as a complete shock. These are my favourite companies to compete against and there's an awful lot to choose from out there.